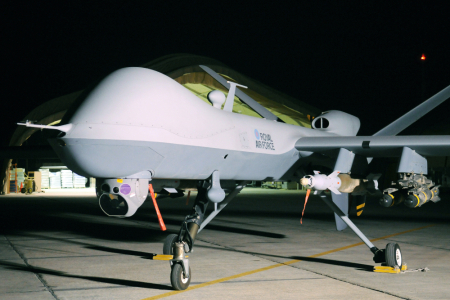 Italy hosts several U.S. military bases on its territory and has consented to allowing drones to fly from one of them. So far, there has been a complete lack of transparency on the agreement. The government must be held accountable by showing the legal justification for these ‘defensive attacks’ and promoting a parliamentary debate on future actions. Next September 25, we aim to raise awareness and ignite a public debate on international law and human rights standards in counter-terrorism operations a in a conference that we are organizing with Rete Italiana per il Disarmo and ECCHR (European Center for Constitutional and Human Rights). Conference with international experts and activists. In today’s “global war on terror”, started by the US in the aftermath of 9/11 attacks with the complicity of European governments, the use of remotely piloted aircrafts (drones) has gained momentum. Initially employed for intelligence, surveillance and recognition (ISR) operations, armed drones are now hugely deployed in contemporary armed conflicts as well as lethal operations against alleged terrorists (the so-called targeted killings) outside the area of active hostilities. Along with the US and Israel, Europe is a leading actor in the use of this technology, and does not hesitate to support a practice whose consistency with international law is quite dubious. Italy, even though it has no armed drone so far, got the authorization from the US to arm its unmanned vehicles. What is more, our country plays a pivotal role in this new kind of warfare, thanks to its strategic position in the Mediterranean and its military infrastructures made available to the US. The Air-Naval military base of Sigonella has been hosting US drones for years so far. In February 2016, the Wall Street Journal published an article where reference was made to an undefined agreement between Rome and Washington regulating US armed drones in Sigonella military base. Members of the Executive – among whom the then Minister for Foreign Affairs Gentiloni, the Minister of Defense Pinotti and the then Prime Minister Renzi – declared that Italy would allow for the employment of armed drones only for self-defense purposes and upon an ad hoc authorization. As of today though nobody knows whether any authorizations have ever been given and how broad they have been. The increasing development and deployment of this technology is not adequately mirrored by public and political debate. In Italy, in spite of news concerning the first Italian victim of a US armed drone, Giovanni Lo Porto, a strong public debate around the resort to armed drones for lethal operations and the actual role played by Italy in these is still missing. Given the alarming paucity of information released by Governments, the Conference intends to trigger an in-depth discussion on the implication of drone technology from the standpoint of international law, taking into due consideration both the political and the military aspects.